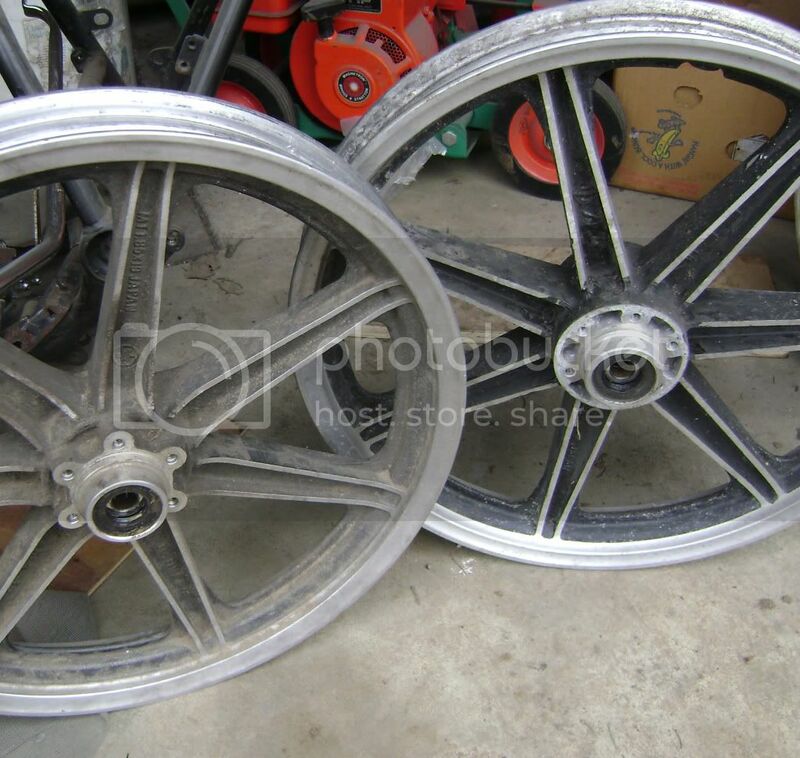 The rear wheels are identical except for the holes for the 'bead locks'... tube wheel on the left. But that's not the only differences; the tube wheel is a different casting, not just machined different. The tube wheel is on the right in this pic, and you can see that the rotor mount is the obvious difference, but what's less obvious is the tube wheel is a heavier casting; the thickness of the spoke webs is .050" thicker over the tubeless wheel. The tube wheel weighs almost a pound more. Last edited by crazy steve; 02-18-2013 at 11:48 AM. 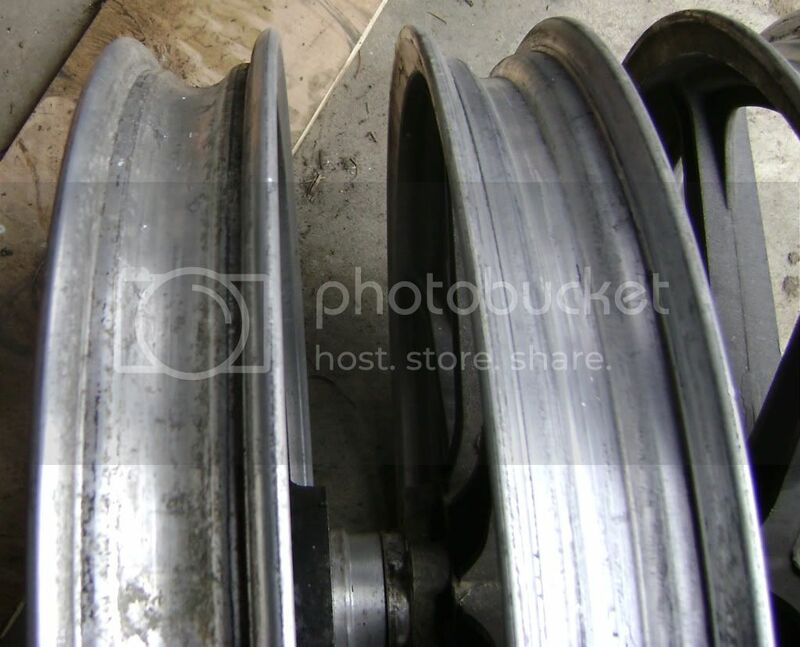 As has been noted (and has been on prevous threads on this topic) the profile at the side of the rim, where the tire bead meets the side of the rim, is different between the tube and tubeless rims. There is also a difference in the construction of the tire. Tubeless tires tend to have lighter and more flexible sidewalls, and often have reduced rolling resistance when compared to a tube-type tire of otherwise equal specifications. The bead area is, most often, constructed differently between the two styles. Tubeless tires tend to have more reinforcement material in the bead area. The danger of using tubeless tires on tube-type rims (other than sealing the rim lock holes) is that in low-pressure situations the tubeless tire on a tube-type rim is more likely to break the bead between the tire and rim. Think about that for a moment, and consider that if you get a puncture in a tubelss tire on a tubeless rim, the tire is more likely to stay beaded and let you come to a controlled stop. The same tubeless tire on a tube rim may suddenly dis-bead and flop from side to side, making an otherwise controllable stop into a white knuckle affair. I guess the question is, "Do you feel lucky?" Best bet, from a safety perspective, is to to use the suggested combination: tubes in rims not marked as suitable for tubeless tires, and tubeless on those rims that are marked for tubeless use. Sure, you can do otherwise, but understand there are additional safety risks in doing so. "They originally had a J designation stamped on them to signify they had a single 'safety' bead, the aim of which was to retain the tire on the rim if it deflated. 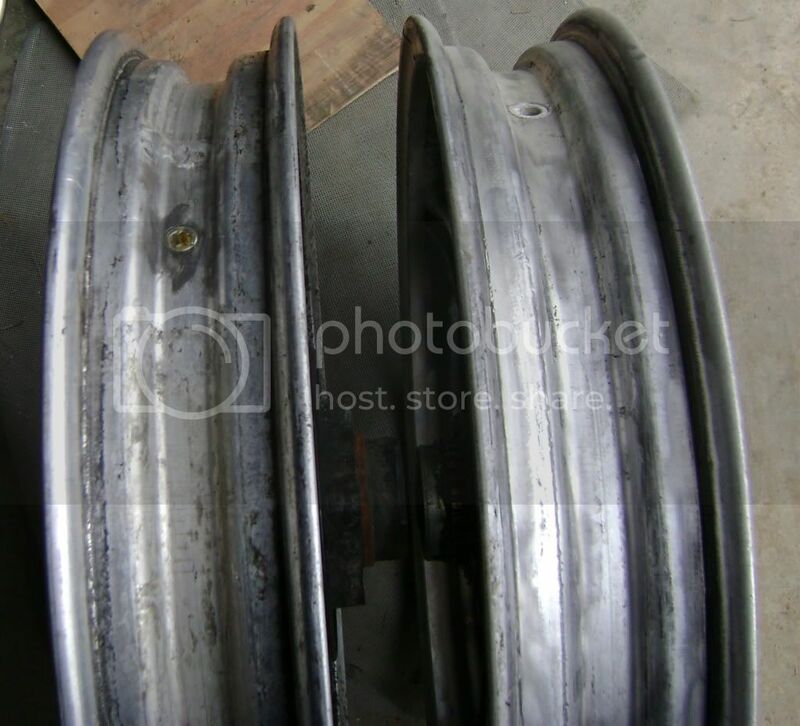 These rims have a visible raised bead near the lip that the tyre 'pops' over to seal against the rim edge. They will have stamping something like ROH 14J 5 (or similar) which will be the manufacturer, diameter, J for safety and then the rim width. With the use of tubeless radials they went to double safety beads, I think in the 70s (?) with are designated JJ (e.g. ROH 14JJ 5) which have the raised safety bead on each side of the rim. Most build standards now require JJ rims." Tire construction; tube tires usually have the lighter sidewall. The big difference is the tubeless tire has the 'tube' built into the tire, having a 'extra' inner liner to retain the air. That's why when you fit a tubeless tire with a tube you have to downgrade the speed rating, as the additional thickness of the tire/tube combo retains more heat. As to the danger of a tubeless tire losing it's seal on a 'tube' rim, that depends. On the XS wheels, the rears are exactly the same except for the 'rim lock' holes on the 'tube' wheel and the lack of the stamped 'suitable for tubeless' marking. There is a difference on the fronts however, and I'll fully agree that using the tube-type XS front rim with a tubeless tire is not something I'd do.